The bane of my life, when it comes to building these models, is lighting. After all these years you would think I would have it sorted but no. There came a day, at the Gold Coast Show, many years ago, when one of my plastic grapes, with a rice bulb inside, started sending up smoke signals. This, as you can imagine, is NOT a good thing. Since then I've looked at how to lessen the risk of fire. Some time back a friend asked why my models where not run by battery! Now why didn't I think of that? So that started me on my road to change ALL the lights (and that's a lot!) to LED's. I was told they use very little power and have no heat. This is not so. Contrary to belief LED's do actually generate heat but it is miniscule also there are heaps of different types of LED's which is reflected in the price. Some cost $6.00 each! You would not believe how many ways there are to wire lights. It's mind boggling and its not just light bulbs. Its voltage of power and the ohms of resistors which change depending on the type of LED and the amount (voltage) of power you are using. I have found that the list Jaycar supply in their catologue invaluble as it lets you know what resistor you should have for what light depending on the power supply. 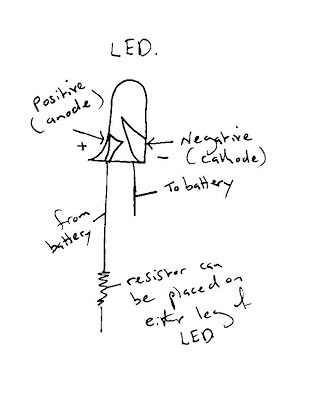 I have also found that checking what voltage goes through the LED and the resistor is a good thing to know. You do this by using a multimeter. The value of the resistor depends on the voltage (power) you are going to use. In my case either 9v or 12v batteries. 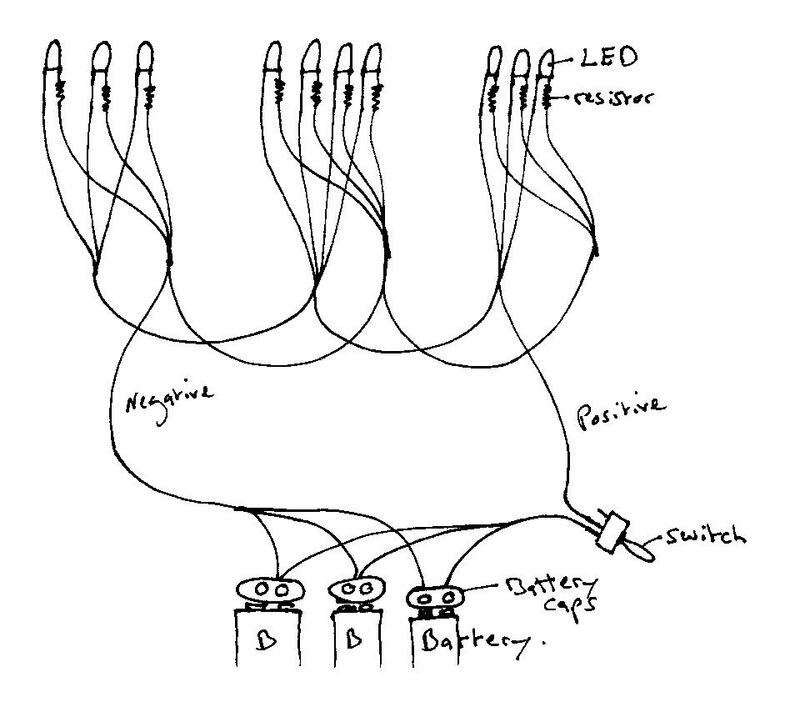 I have supplied you with an diagram of the wiring that I will now be using for all my models. I've been told that with this design the power only has to travel 1/2 the distance. This design is used even if you are using just one battery. I suppose an explanation would be good. 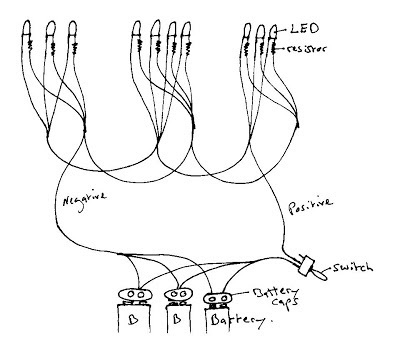 Flashing bulb's and UV LED's are on there own separate wiring system and battery pack with their own switch (this is because I wanted it that way)This not necessary BUT DO NOT have a flashing bulb on the same wiring system as your indoor lights as they will flash as well. No matter what anyone says each LED needs it's own resistor. Power only travels one way in LED's. This what an LED looks like and how I used it. 4. 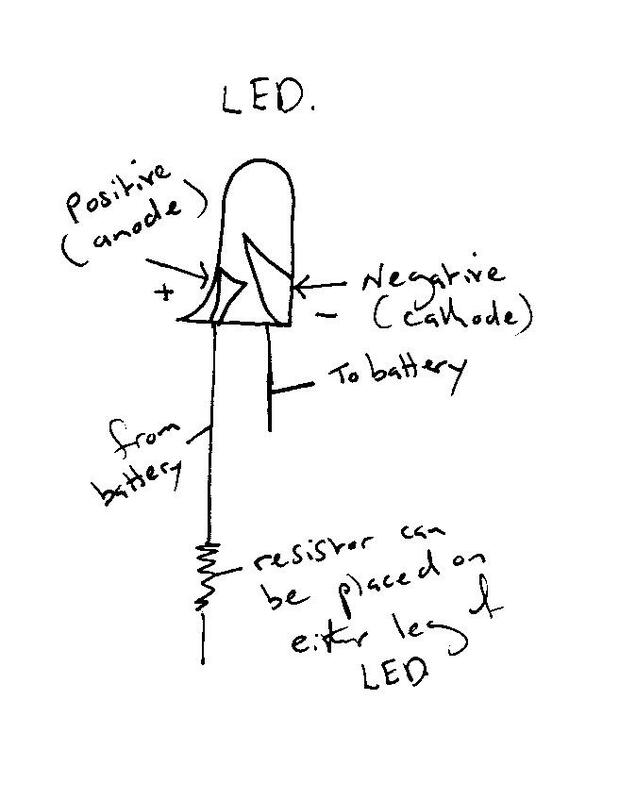 You can blow the LED bulb if it DOES NOT have an resistor soldered to it. 5. Use heat shrink tubing to cover any bare wire. 6. Solder ALL joins and ensure they are a strong bond by pulling on them. 7. Use the same colour for negative lines and a different colour for positive. I have sometimes got these mixed up and it takes ages to sort it out because of course one of the bulbs won't shine because the power is going the wrong way. You do not need (for this job) a special wire for negative and a special wire for positive. Wire is wire. It is a road for the energy to flow along. The colour of the outside of the wire is there to make it easier for you to know if you are dealing with a negative flow or a positive flow. ie; blue and blue together, red and red together etc. One blue goes on a positive wire and one blue goes on the corresponding negative wire for that one light. This WILL make your life much easier.